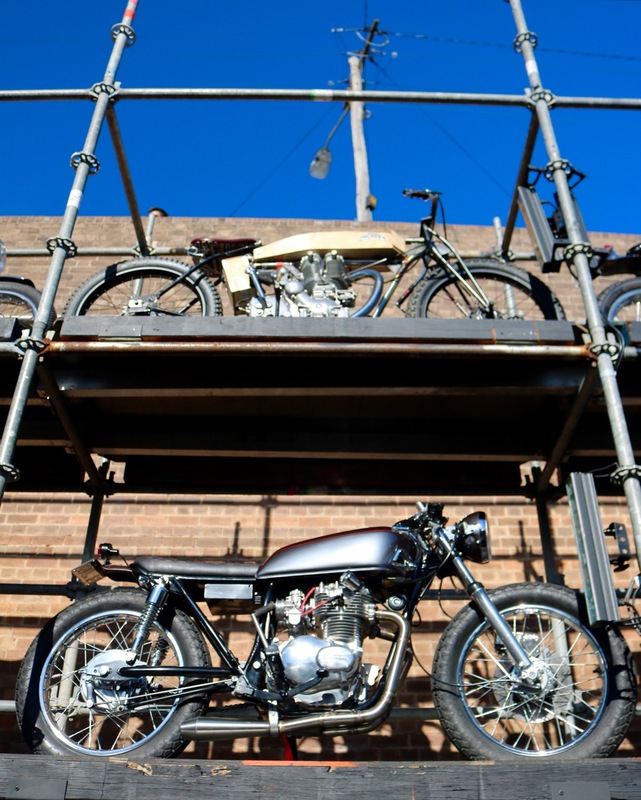 Blue skies, beers and bikes. Throttle Roll had everyone covered. The custom bike scene can be split into two very broad groups. There’s the guys and girls who decide they want to ‘cafe’ their 1982, CB two something Honda, flip the handlebars up-side down and call it a day; and there’s the true masters of their domain who craft motorcycles that are equal part art and mechanical device. Throttle Roll celebrates the latter of the two and also welcomes the first group to attend. It’s the perfect mix of street party and educational event. 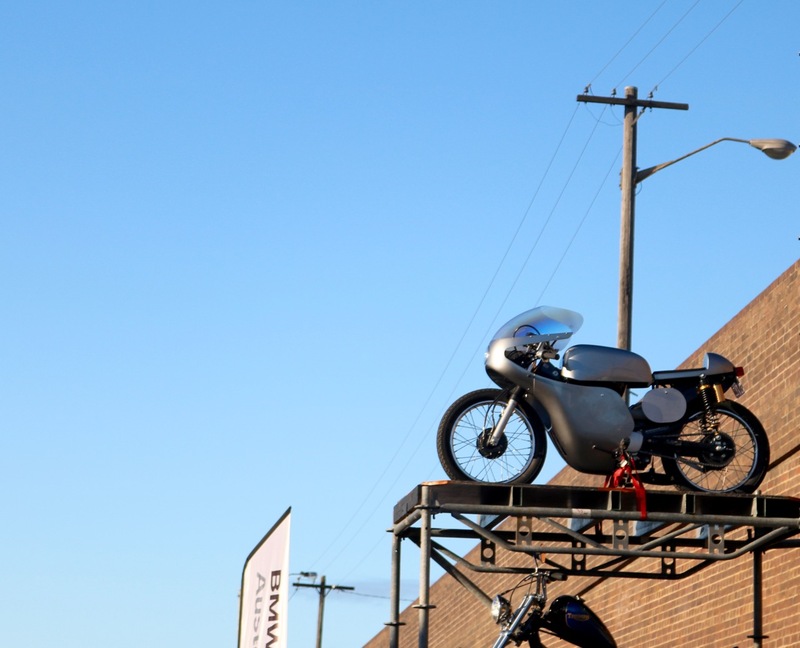 This year’s Throttle Roll was by far the biggest event since its creation in 2013 by the same man who brought you the Distinguished Gentleman’s Ride, Mark Hawwa. 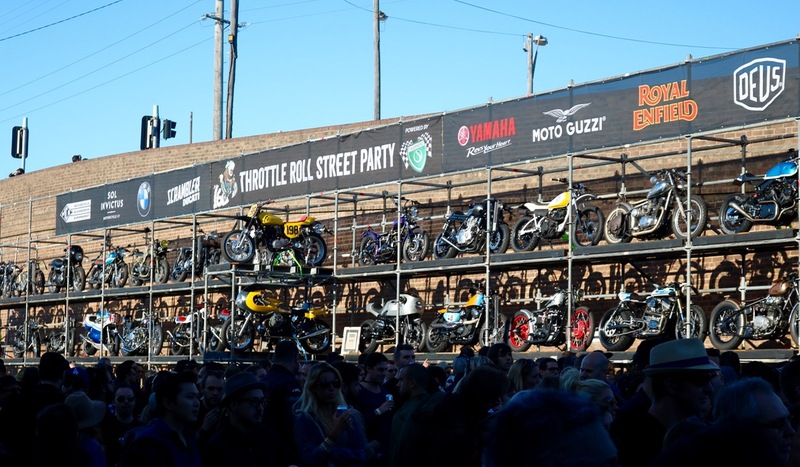 The event has grown over the years, and while it initially took up the court-yard of the Vic Enmore Pub, this year it took up an entire street in Marickville. No two bikes were the same. Impressive to see sponsorship from major manufacturers like Yamaha and BMW. To call the mix of bikes present eclectic would be selling Throttle Roll short. While most shows group a certain genre of bike/vehicle/piece of art with other similar, bikes/vehicles/pieces of art, Throttle Roll is a delightful mix of chopper, next to Honda scooter, above old Triumph race bike. It’s all the better for it too. While the wall of bikes was impressive, almost as remarkable were the 200+ bikes parked just inside the event’s front gates. This immaculate Yamaha RD350 cafe racer parked in-between two 1980’s Harley lounge chairs cruisers was looking fast standing still. Just look at those underslung expansion chambers and period correct solid disc brakes! 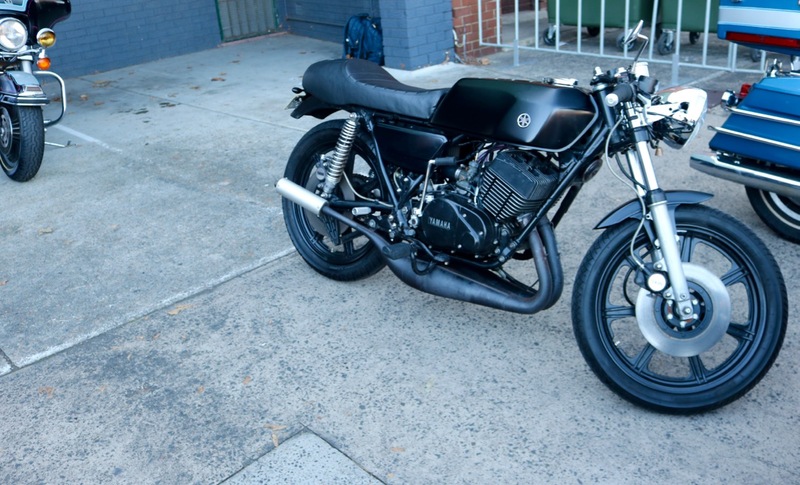 Cafe racer perfection? Something tells me that fouled plugs would be the order of the day if this thing wasn’t wrung out occasionally. Another particularly nice bike that was lurking in the parking lot was this modern classic Triumph Bonneville. 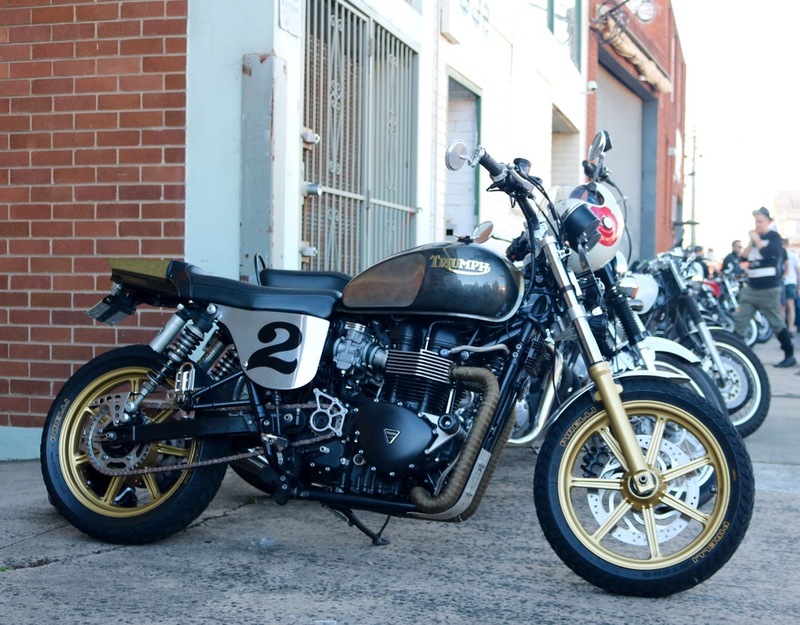 A staple of the cafe racer and custom scene, this Bonne’ had a few interesting tricks up its sleeves, like the extended swingarm, wild exhaust routing and custom side covers. Extended swingarm and custom side covers set this Bonne’ off. Back on the wall, one bike that caught my eye was sporting a Harley motor which was a shock to me, as I’m not usually a fan of American iron. The bike (pictured below) looked to be sporting a fairly modern, fuel injected 1200cc lump and if it weren’t for the wheelbase that spanned into neighbouring Newtown, it might have even taken corners with aplomb. The Suzuki GSXR sourced front-end and exhaust that featured interchangeable end sections, teamed with the perspex air cleaner and cam cover were just a few of this bike’s highlights. GSXR front-end teamed up with a 1200cc Sportster lump and a wheelbase as long as the list of modifications. At the other end of the spectrum, was this Honda Ruckus which looked like it had appeared from some U.S ‘Stance Nation’ car show. These Ruckus’ (Rucki?) are a rare sight on Australian roads. Usually sporting 49cc single cylinder four stroke motors, they aren’t exactly what you’d call the most sporting of scooters. 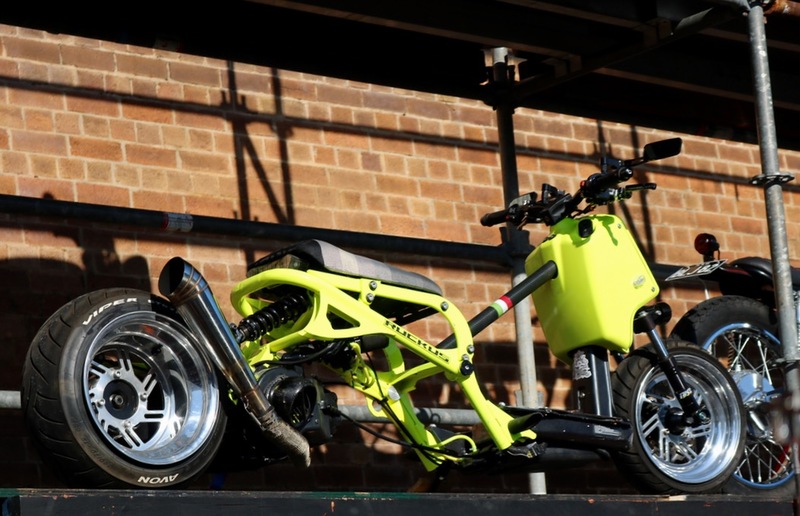 This Ruckus had the full spectrum of parts thrown at it including a fairly serious stretch, fat rear tyre and a Moto-GP style exhaust. I’n a sucker for a stretched scooter and this Ruckus was nearing perfection (for me, anyway). The last bike I want to bring your attention to was this perfectly executed 70’s style chopper, complete with glitter paint and leaf sprung front-end. Just check out those twin, stacked rectangle headlights and absence of any form of front brake. 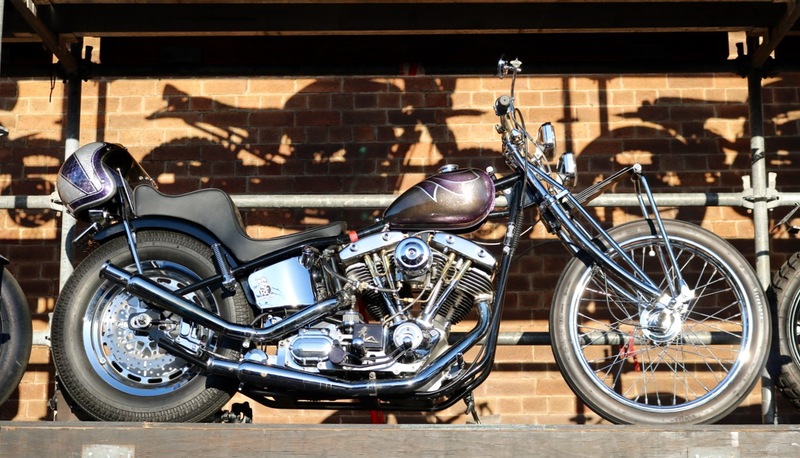 The chrome on this bike was also worth noting, looking like you could dive into it, the shine was so deep. Two Harleys in one post. Not something you’ll see often on Twist and Lean. This 70’s chopper was a thing of beauty. 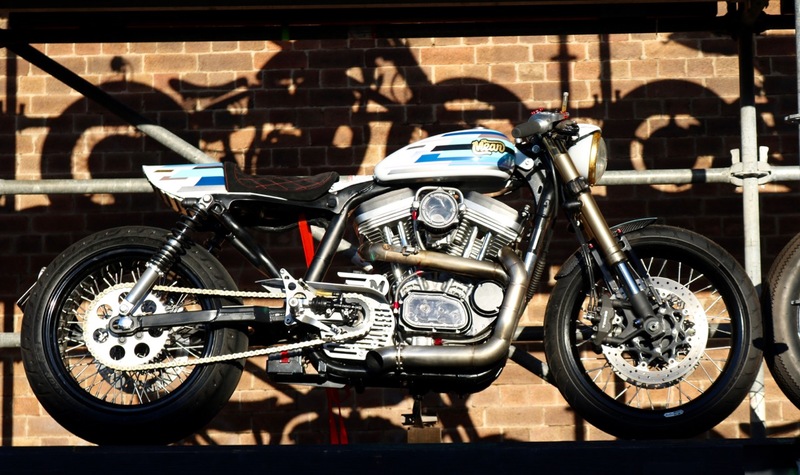 Throttle Roll has to be one of the most inclusive bike shows in Australia. It welcomes anyone with a love of motorcycles and offers them an insight into genres of bikes that normally wouldn’t even be muttered in the same sentence. Not only that, it lets all in attendance get up close and personal to really drink in all the details, hopefully teaching people a thing-or-two about what makes a custom bike tick. Stacks on stacks. Throttle Roll had them all.